This walking picture is just typical of hundreds of thousands, and turned up amongst some recent finds. As is often the case I’ve no idea who the couple are, or where it was taken – although the style of the lamp-post might provide a clue when I have the time. I just liked the slightly resigned expression on the gents face, and the tab hanging from the mouth Andy Capp style. His wife is looking more robust, and has kept her hairnet on so perhaps they’re on their way somewhere special. I’d think it was taken in the Forties, both by the fashions and the smaller print size. One of tens of thousands of images taken on the ‘pullover’ between Mablethorpe High Street, over the dunes, and on to the promenade. Read more about this popular spot for Walking Pictures on the site here. Although Sunbeam were the premier walkie company in Margate, other firms did take photographs in the town and surrounding area. “Holiday Snaps” were one such business, based in Charlotte Place in Margate before WW2. They were certainly taking walking pictures in the early 1930s but like other firms, they did static portraits in the street as well. I found this example recently, taken on one of the bridges across the beach access routes. 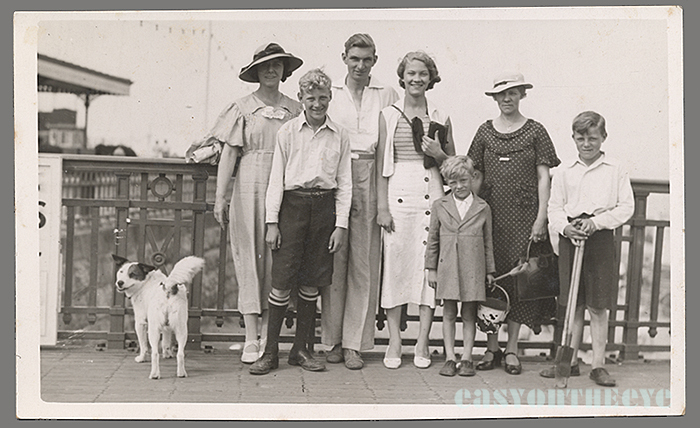 It seems to be Mum and Dad, with their three sons, plus perhaps the children’s Gran and a family friend. It looks as if the photographer was based on the bridge, that’s probably the Holiday Snaps board just peeping into the left of the shot. What made the portrait for me though was the mongrel, which has strayed into shot, turned it’s back to the camera and raised it’s tail! 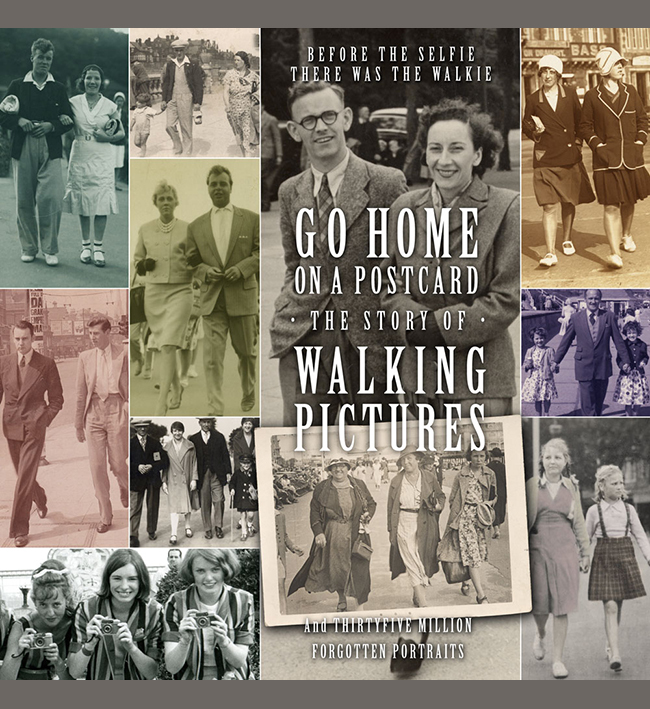 This little walking picture has been sitting in my ‘unidentified’ file for ages. The sweep of the beach had a feel of Blackpool about it but I couldn’t match it up to anything so put it to one side. 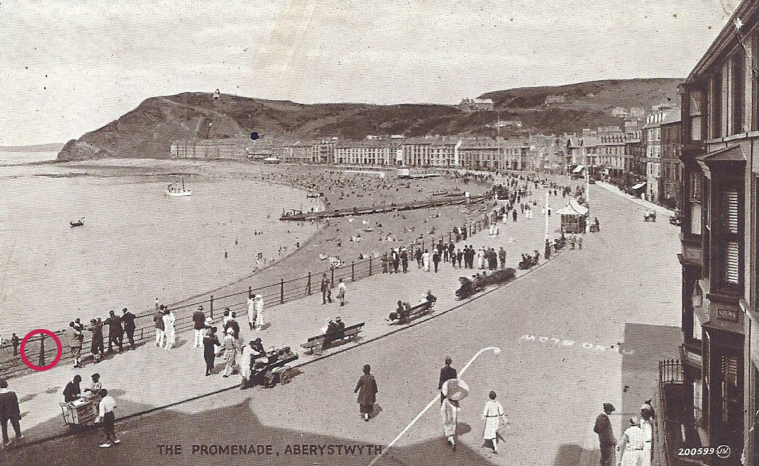 Then the other day I was watching an episode of the BBC history of Wales series, and the helicopter cameraman swept along the coast at Aberystwyth. Something about the seafront development reminded me of this walkie, so I hunted about for photos online and realised I was on the right track. The old sea railings have gone but this old postcard confirmed them and the curious wooden gangway on the beach. 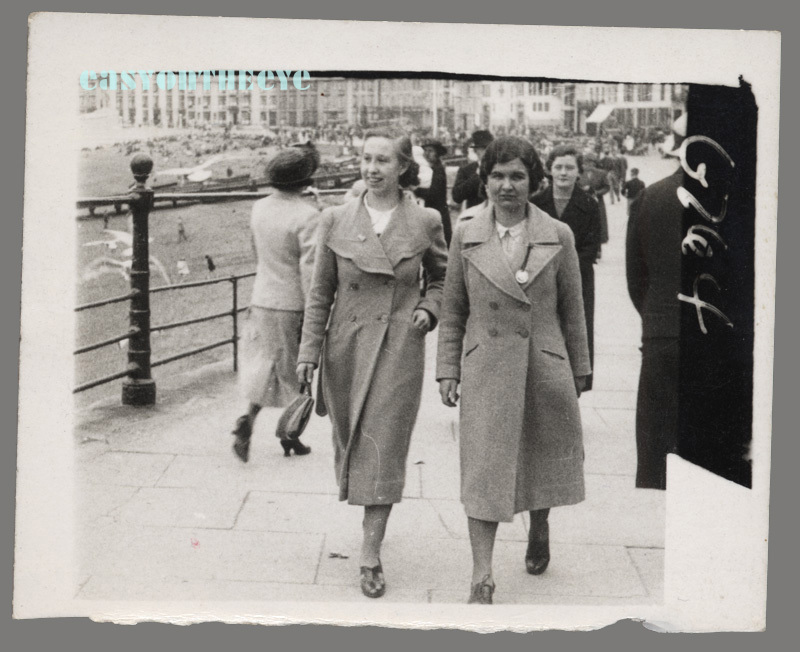 The cameraman must have been lurking around near the pierhead but there is nothing on the card to tell us who took it, or who it is, though at some time one of the women has dated it on the back in pencil 1939. 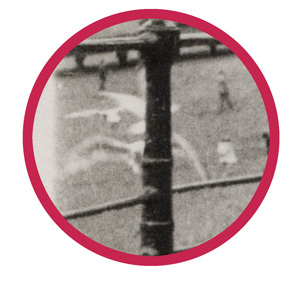 The photo has been torn off what may have been a sequence. I did wonder what the white marks were on the left by the upright column; seagulls caught in mid-flight!